Rising inequality in both rich and poor countries has attracted attention from economists, politicians, International Monetary Fund and even the Pope. Because of its strong correlation with social and political instability, this trend must be better understood. Laos is an example of the challenges that many developing nations face in balancing the need for growth and poverty reduction against a seemingly inexorable rise in inequality. In the two decades following its emergence from a long period of instability in Southeast Asia, inequality in household expenditures in Laos rose substantially. At the same time, absolute poverty incidence fell sharply. Not only does an increase in inequality raise the level of poverty incidence, given the level of national income, but there is evidence that a high initial level of inequality reduces the amount by which poverty incidence declines for a given rate of growth. Since the early 1990s, five rounds of the Lao Expenditure and Consumption Surveys (LECS) have been conducted and these data measure consumption expenditures, but not incomes, at the household level. Employing the most recent survey for the first time, inequality measured by the Gini coefficient increased at the national level from 0.311 to 0.364, over the two decades ending in 2013. But is this increase noteworthy? We find that not only is the estimate of population-wide inequality statistically significant, it is also widespread. Inequality rose within both rural and urban areas, within almost all provinces of Laos and within each of the four major ethnic groups of the population. At the same time, the estimated incidence of absolute poverty has halved, from 46 percent of the population to 23 percent. Put together, these facts mean that the poor of Laos have become better off in real terms, but that the rich have benefited more, in both relative and absolute terms. A measure of the importance of this increase in inequality is that if the real expenditures of all household groups had, hypothetically, increased at the same rate from its 1992-93 level, absolute poverty incidence would have declined from 46 percent to 17 percent. That is, increased inequality reduced the amount of poverty reduction that occurred over the last two decades by around 6 percent of the population, compared with the hypothetical reduction that would have occurred if inequality had not risen. In contrast to rising inequality in household expenditures, access to publicly provided services (primary education, lower secondary education, access to health care and household access to the electricity network) has become more equal. That is, disparities in participation rates between richer and poorer groups have diminished. This suggests that measures such as the Gini coefficient need to be supplemented with additional information before a full picture of inequality can be arrived at. While improved access to public services in Laos suggest that the picture painted by expenditure inequality is overly bleak, it is also generally the case than income inequality is higher than expenditure based measured, and asset inequality higher still. Unfortunately, data limitations prevent an analysis of income or asset inequality. 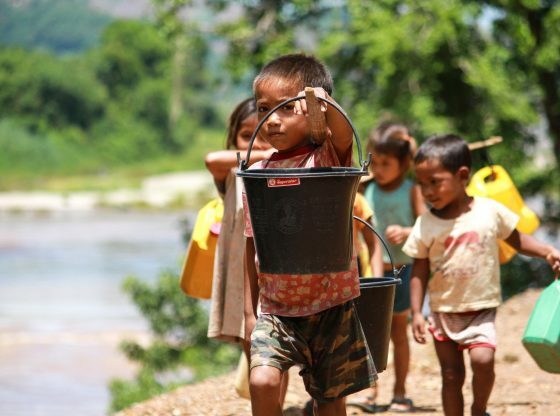 Should poor countries (like Laos) necessarily be concerned about inequality? Surely, in low-income countries the priority must be the reduction of absolute poverty. Taking this proposition as given, there is ample reason to think that inequality, as well as the rate of economic growth, can be important for poverty reduction. The extent to which inequality is bad for poor countries presumably depends on whether it is transitory or persistent. If it persists, in that inequality begets more inequality, it could increase social tensions and disrupt peace and order. This will harm growth, and thereby undermine further attempts at reducing poverty. Rising inequality in countries where a large proportion of the population remains poor may indicate that a significant share of the labour force is either underemployed or unemployed, or at least not participating fully in the growth process. This could potentially put at risk the sustainability of the growth process itself, quite independently of any social disruption that it causes. If it is transitory, in the form posited by the famous Kuznets hypothesis, then its detrimental effects will be short-lived. Whether rising inequality is likely to be persistent or transitory depends on a number of factors, not least the underlying causes of the high or rising inequality, as well as reactions to it through policy changes. The linkages between poverty reduction, inequality and growth are complex and subject to continuing controversy. Whether the increase in expenditure inequality is already a serious public policy problem for Laos is debatable. Some increases in inequality may be inevitable in a poor country undertaking a wide-reaching programme of economic reform, as in Laos over the past few decades. What is not controversial is that for social, economic and political reasons, economic inequality needs to be monitored and better understood. This article is based on a joint study with Peter Warr and Sitthiroth Rasphone, which can be downloaded here.